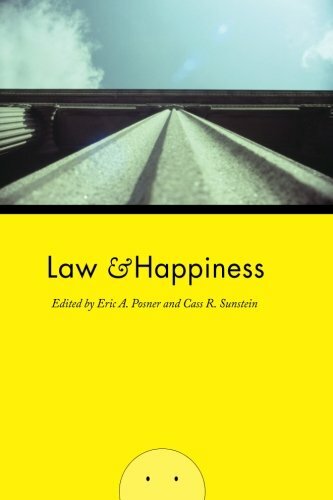 Law and Happiness, edited by Eric A. Posner and Cass R. Sunstein, University of Chicago Press 2010. Since the earliest days of philosophy, thinkers have debated the meaning of the term happiness and the nature of the good life. But it is only in recent years that the study of happiness – or ‘hedonics’ – has developed into a formal field of inquiry, cutting across a broad range of disciplines and offering insights into a variety of crucial questions of law and public policy. Law and Happiness brings together the best and most influential thinkers in the field to explore the question of what happiness is – and what factors can be demonstrated to increase or decrease it. Martha C. Nussbaum offers an account of the way that hedonics can productively be applied to psychology; Cass R. Sunstein considers the unexpected relationship between happiness and health problems; Matthew Adler and Eric A. Posner view hedonics through the lens of cost-benefit analysis; David A. Weisbach considers the relationship between happiness and taxation; Mark A. Cohen examines the role that crime – and fear of crime – can play in people’s assessment of their happiness; and, other distinguished contributors take similarly innovative approaches to the topic of happiness. The result is a kaleidoscopic overview of this increasingly prominent field, offering surprising new perspectives and incisive analyses that will have profound implications for the law and our lives. Eric A. Posner is the Kirkland and Ellis Professor of Law at the University of Chicago Law School. He is the author or coauthor of several books, including The Perils of Global Legalism. Cass R. Sunstein is administrator of the White House’s Office of Information and Regulatory Affairs, Office of Management and Budget, on leave from Harvard Law School.